All of a sudden, there’s this wave of consciousness doing the rounds in the digital world. That’s pretty good though (don’t get us wrong)! First, Apple launched the ScreenTime app on iOS 12. Then, Google came up with its Digital Wellbeing on Android 9 Pie. Both these initiatives were motivated by the desire to inform smartphone users of their screen time and help them limit it by actively providing detailed data and pattern of phone usage. Now, after the two major smartphone OSs in the world, it seems like the app ecosystem has taken a liking to this concept and many apps are introducing similar functionalities on the app itself. 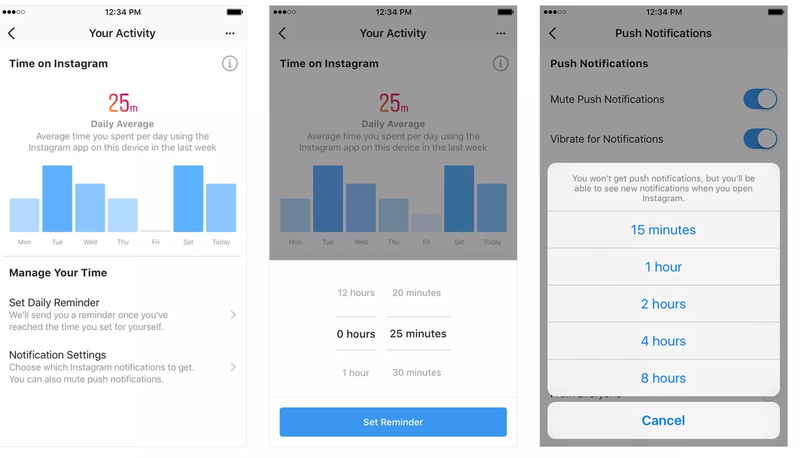 According to the TheVerge, Instagram has reportedly launched an update with the function called “Your Activity” that tracks the amount of time you spend on Instagram and even lets you set daily limits while hiding push notifications. To access this function, you need to install the latest Instagram update. After that, launch the app on your phone and tap on the hamburger menu on your profile page. Then, look for the option called “Your Activity”. Reportedly, Facebook is also coming up with a similar update with the function called “Your Time on Facebook.” It is worth noting that Instagram is a subsidiary of Facebook. This new wave of consciousness can be traced back to several studies that indicate spending too much time on screens can damage a person’s health. It is also being surmised that phone addiction is as real as any other accepted forms of addiction and requires conscious effort to not fall victim. It is indeed a step in the right direction, but will these initiatives be enough is something only time could tell.